We are all created by God with an intention in mind. God gives us the gift of free will and intellect so that we can freely accomplish his intention for us. This intention from our Creator is our vocation, and is our supreme joy and purpose. We all have one thing in common as each and every one of us is called to the vocation of holiness. This vocation consists of knowing, loving and serving God in this life and being with him forever in the next. How this life of holiness is lived out day-to-day branches into three different vocational states of life. Most are called to live out a vocation of married life. Those who are married are called to be signs of Christ’s union with and love for his bride the Church, which is all of us. Then there are those who lay down their lives by taking religious vows so as to more closely live as Christ lived, such as cloistered nuns, sisters and brothers. Along with those in the religious life, there are those called to imitate Christ in a unique way through their ordination as deacons, priests and bishops. Looking back, there were three moments in which I heard the call to the priesthood. The first time I was a junior at Marian High School, Tamaqua. On one of the days in the spring, our class had a priest and a sister come to talk to us about vocations. The underlying message of their talk was that of service. They spoke of how one of the major facets of the priesthood and religious life focuses on helping the helpless and being there with those going through a crisis by giving them the hope of Jesus Christ. When I heard this message, I experienced a pull at my heart to live a life as a priest, totally in service to others. However, after reflecting more on the experience, I decided to help others as a work vocation rather than a religious vocation. The second time I experienced God’s call to the priesthood I was a junior again, but this time at DeSales University, Center Valley. As a junior in college and a science major who thought he knew everything, I began to drift away from the Church. Fortunately, God was able to break through my apathy, using the very discipline that caused the rupture, that of science. Concluding that God must have created matter at the beginning of time or else we would fall into the trap of infinite regress, the reality of God became palpable in my life. Through this experience I decided to enter seminary studies for the first time. I entered St. Charles Seminary and spent three years in studies and formation until I discerned God was not calling me to the priesthood, at least not at this time. My final call to the priesthood happened while working as a registered nurse. After leaving the seminary, I still felt an intense desire to help those who needed it most. I decided to go to nursing school, and after a few short years I began my work as a nurse at the hospital level. It was during this time of being there with families going through crisis I felt God calling me back to the priesthood. In many beautiful ways God showed me his love through the patients I treated. Since love is desiring another’s highest good, I prayerfully began to discern the greatest way I can love God and others. My prayerful conclusion through quietly listening to the Lord’s call is to bring people Christ through my actions, words and most especially the sacraments as his priest. My friends and family have always been supportive, even those who are not particularly religious. Deep down, all of us are hardwired to support those we love to attain their goals and highest potential, as long as it falls within the parameters of what we see as good and true in life. I am blessed to have that caliber of friends and family surrounding me in my pursuit of the priesthood. My interests and hobbies vary widely. In terms of athletic interests, I enjoy snowboarding with my friends, lifting weights and long-distance running. A few months ago I completed the Philadelphia Half Marathon, running with about 25 of my fellow seminarians. Academically, I enjoy reading, especially the classics. Musically, I have played guitar for about 15 years now. Also, I am part of a band at the seminary, and we play for the biannual “Theology on Tap” that St. Charles hosts. Finally, my spiritual hobbies consist of hiking outdoors, where I experience a strong connection to God through his creation, and reading great spiritual works, such as “The Imitation of Christ” and anything by Pope Benedict XVI. Life at the seminary is challenging and rewarding. I have made some of my best friends going through my years of formation to the priesthood. The seminary has devoted time for communal prayer and three beautiful chapels on the grounds, which are always open to spend time with Our Lord. Seminary teaches us how to give ourselves to the present moment issues and stresses while being rooted in God through prayer. With only a year and a half left until priesthood ordination, God willing, I am thankful for the seminary formation to equip me in spreading the Gospel of Christ in a world that has, in many ways, lost hope of the transcendent. 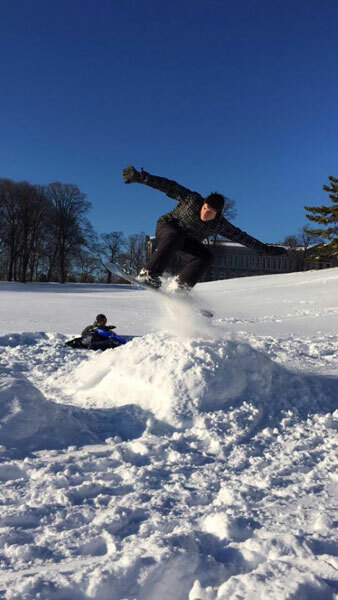 Giuseppe Esposito, Diocesan seminarian, snowboards on the grounds of St. Charles.